We don't go to Malacca for Jonker's Walk, and we certainly don't go for the shopping mall that's been erected on the square where Malaysia's independence from British rule was declared (what were city officials thinking?!). 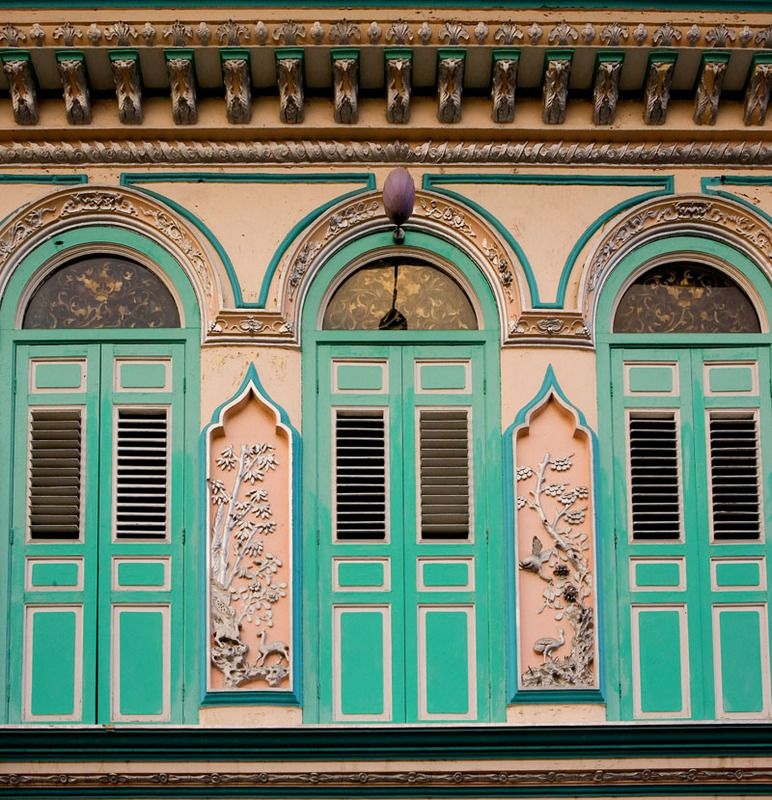 We go to admire the old Peranakan houses, steal glimpses of what remains of old Malacca in the historic center, and - of course - eat. The best time to wander Malacca is early in the morning, when there's no traffic clogging the old streets (less of a concern if you're there on a weekday) and life goes on pretty much as it has for decades: here a long-time resident selling steamed spice bread from a stool set up outside the front door of her lovely old house, there a grandad doddering down an alley on the way to dim sum. A pork seller begins to set up shop on a side street, a popiah seller makes popiah skins in a shop on its fourth generation, tinny Chinese pop music wafts out of the second-story window of a row house, a housewife slowly sweeps her stoop. We walk Kampung Pantai Road across the river, where it turns into old Mill Road, and then into Egerton Road. 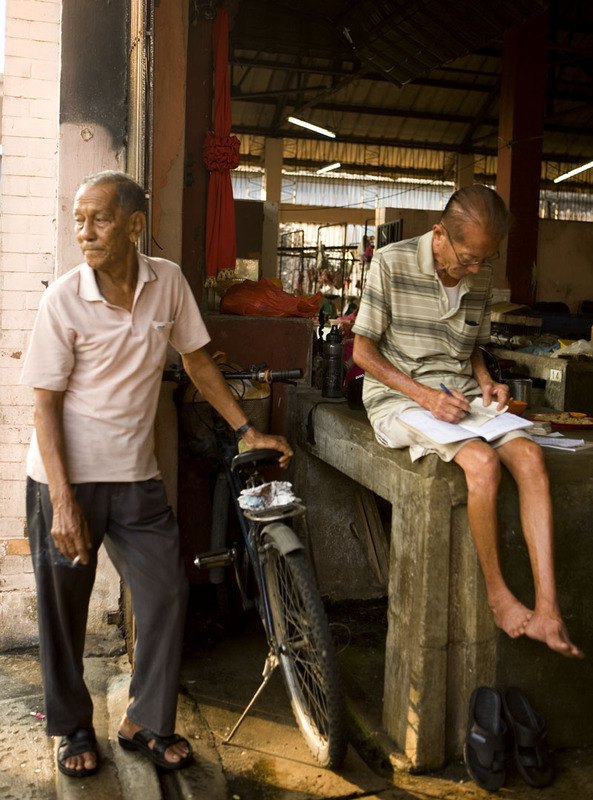 At the confluence of the two roads stands Eng Seng Market, the last in Malacca's old center. 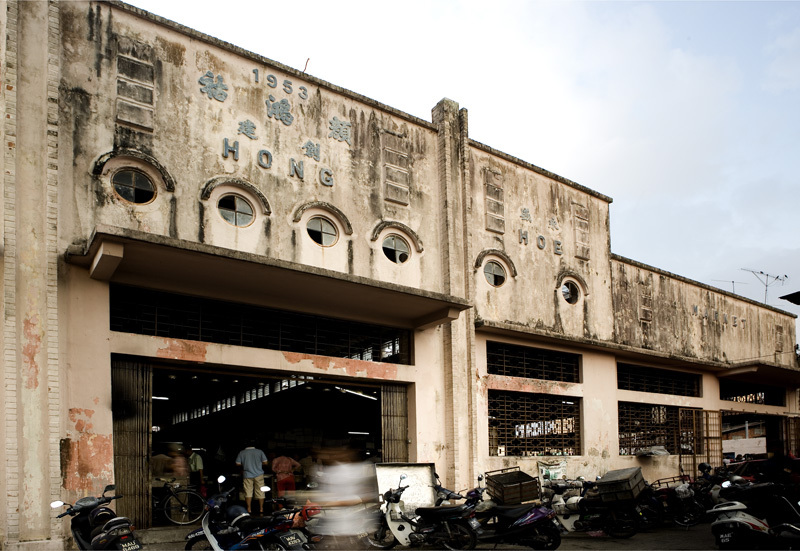 The market dates back to the early 1900s, though the structure itself wasn't erected until 1953 (notice the Art Deco elements in the building, above), the donation of a wealthy Chinese Malaccan named Gan Hong Hoe. We wonder if it isn't his portrait that hangs high on the market's front wall. Eng Seng isn't large, and though it's fantastically frantic early in the a.m. and boasts a fair selection of tasty prepared goodies, sold outside next to the building, I suppose there's nothing particularly special about it. 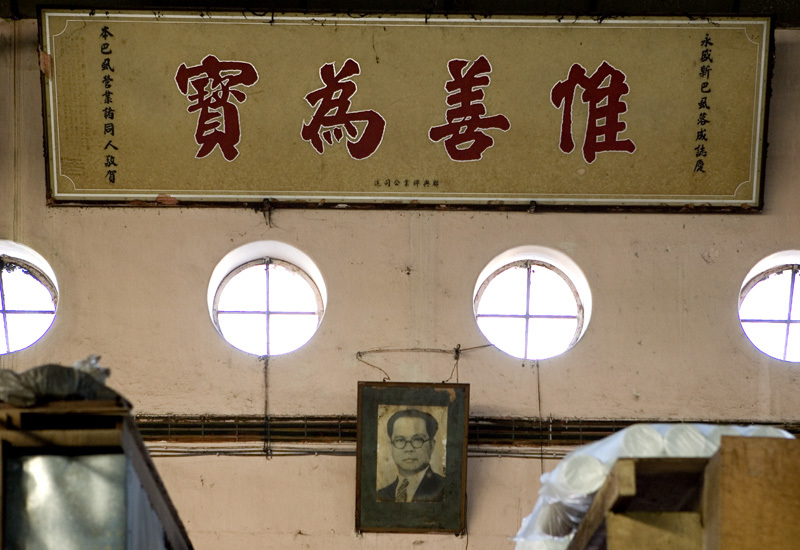 But Eng Seng has hung on in a town that's seen quite a lot of beautiful and historic structures razed since the late 1980s, and that makes us partial to it. A vendor tells us that ten years ago the city government planned to demolish Eng Seng and replace it with a ten-story building. The plan was protested and eventually scrapped and for now, at least, Eng Seng is safe. Behind the market is a food court of sorts where we like to grab our first, second, and sometimes third coffees of the morning. There are battered plastic tables, stools, and a number of stalls selling foods like char yoke (roast pork - meant for takeaway, but one of these mornings we'll give in, purchase a couple hundred grams and eat the burnished, crackly-skinned meat with our fingers, as sort of a sans egg variation on bacon and eggs), noodles, and fish balls (very popular with the locals). 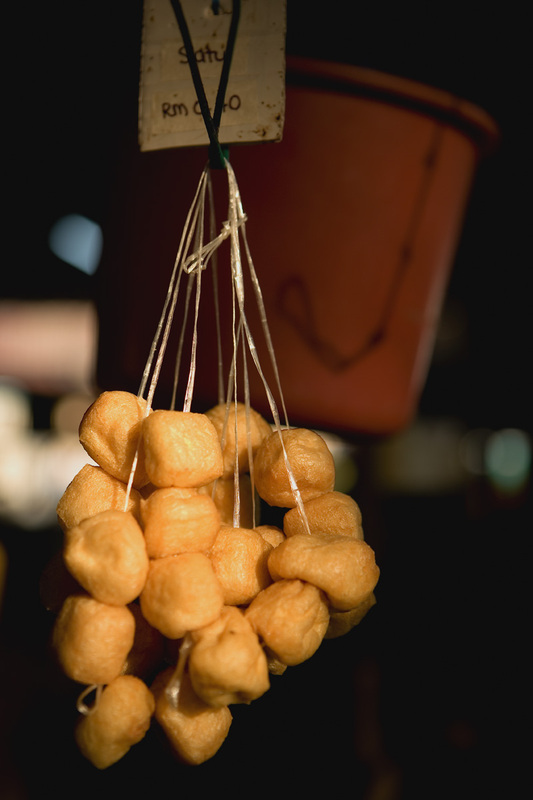 While working on my second coffee I notice a flurry of transactions taking place at a stall selling banana fritters and zong, leaf-wrapped rice dumplings. The banana fritters are spoken for before they even emerge from the fryer, and the queue is long. The vendor's Nyonya zong are going fast but somehow I manage to scoop one up. I'll soon wish I'd purchased the rest to take away. 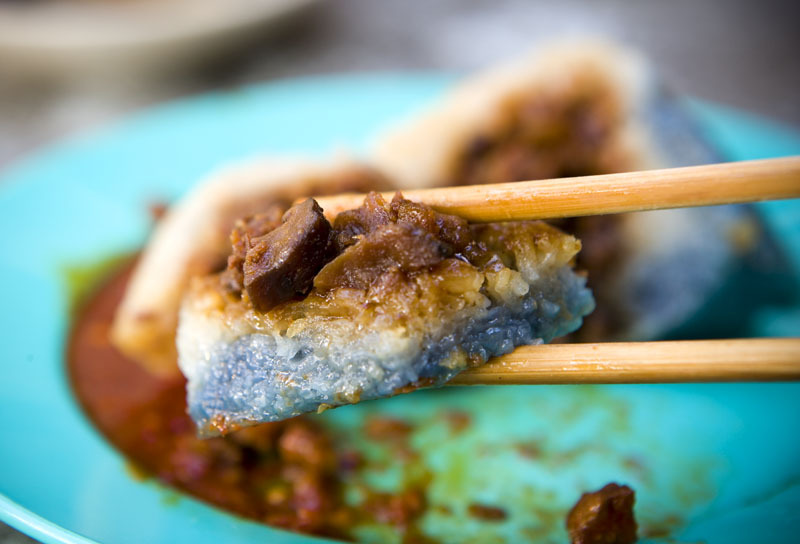 Nyonya zong are tinted blue with the same flower (bunga telaga) that colors the Kelantanese specialty nasi kerabu. Her version contains a savory beef filling extravagantly seasoned with five-spice; the Sichuan peppercorn in the spice mixture is prevalent enough to just ever-so-lightly set my tongue to tingling. The sambal served alongside contains no belacan (a phenomenon we'll encounter several times in Malacca, belacan-free sambal), is extremely spicy in a good way, but in the end distracts attention that should be firmly focused on that filling. Our Nyonya wake-up call. And it won't be the only breakfast of the morning. Dear Robyn, I have learned so much about the alleys, lanes, markets and stalls of Malaysia from you more than from anywhere or anyone. And I am Malaysian! Thank you, thank you. I am very sure that in your previous life (or lives), you and Dave were Asians and perhaps even chefs or cooks, maybe even Malaysian ones at that! That explains your affinity for asian food. And by the rate you are going, I am pretty sure you and Dave will be re-born in this part of the world. Is this a good thing? Well, I certainly think so. Keep up the good work. You must, somehow, someday, reduce your blog into a gorgeous coffee table book. I would be the first to buy! I love the frenetic energy that is found in that "golden hour" as the sleepy town wakes up and its residents face the new day. I wish I could find my Sichuan peppercorns. They're lost in the pantry somewhere. I need them to make my own five-spice powder, and that powder so I can make my own zongzi. Just discovered your exceptional blog and I can't get enough of it - what a wonderful array of eye candy! I am now going thru the archives, lapping everything up. One thing I have discovered is to NOT read it while hungry. 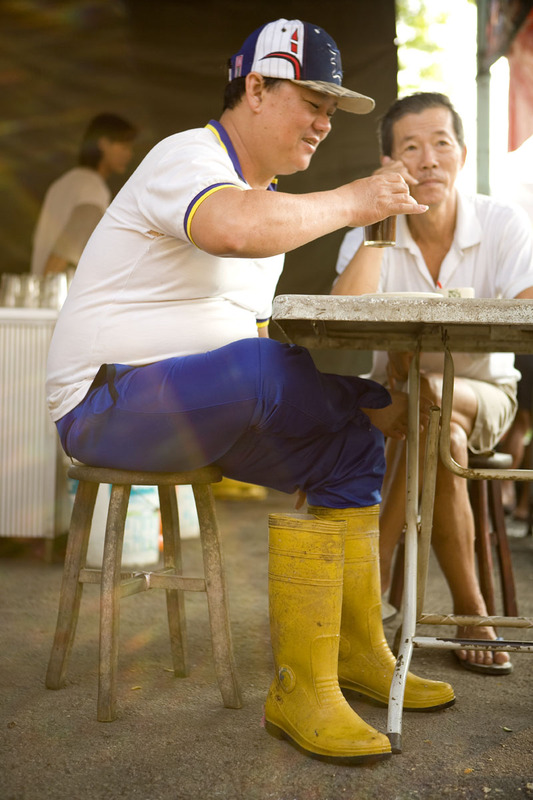 You must have stomachs of iron or steel to be able to tolerate all that street food! But man, everything you write about just makes me want to rush out and try some. Fortunately, that is just not geographically possible - lol! Xander - I have to say, Malaysia makes it easy for the photographer. You'd go nuts with your camera in Malacca, Penang, and Kuching. TJ-thanks for a comment that's especially wonderful, coming as it does from a Malaysian. We do our best. mk- another Malacca post in the immediate future and then one near the end of the month, I think. There are also some old ones, check the 'Malaysia Beyond KL' category in the sidebar. And of course, there will be more Malacca trips in the future. As I said, we are liking that place more and more. Though I now live in Perth, I'm from Malacca with a Nonya background. And yes, we still have our family house on Hereen St.
Also, the next time you're in Malacca, try and go to the Portuguese Square for dinner; the restaurant closest to the sea has amazing sambal fish and otak. oh my, that looks like a nonya version of a 'bak chang'. and the cup of coffee in the background just makes it all complete. give me some!!! I follow your blog avidly. I'm in love with South East Asia and can't wait to go back! All your pictures show the real taste of Nyonya! I heard somewhere (probably from the BIL) that the blue flower tint is getting more and more rare... that many nyonya zong makers are cheating and using blue coloring instead. 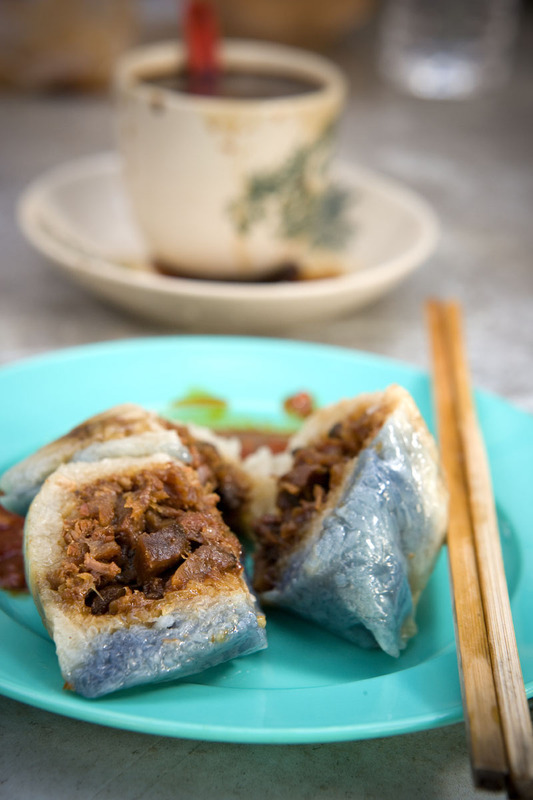 I'd love to know where else in Malaysia the real thing can be found, because I do so love this version of dumpling! And this particular specimen does look beautiful! Dear Robyn and Dave - this is not a post for your blog but more a personal message to say thank you for your marvellous reading. My husband and I travel yearly to SE Asia on our hols (we both travelled the region separately 25 - 30 years ago respectively), and love the food. So whenever we go, we are always sure to read up on your recommendations for the region. Your blog has inspired a lot of my artwork. I wanted to send you a few pics but I don't see an email address or have the ability to do this via this system so all I can do is point you to a URL where you can see some. Next year I will be spending more time painting 'recipes', and again will be spending much time on your blog for inspriation. Hi Gabby -- you are the first reader to tell us that EatingAsia has inspired artwork! Thank you. Hope we continue to do so! I love your paintings.